I love this book the way I love Goodnight, Moon. I love its simplicity. I love that it touches on the metaphysical, but does not dwell. And above all, I love its illustrations. Margaret Wise Brown wrote both books, and in each, her simple prose inspires calming, classical illustrations. 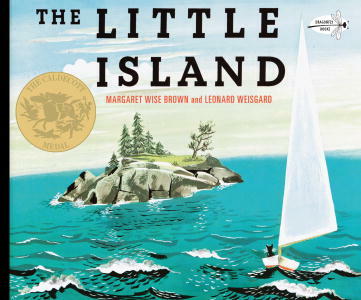 Leonard Weisgard, a prolific artist who illustrated a host of children’s books in the mid-1900s, often collaborated with Wise Brown, and The Little Island is a perfect example of how well suited his paintings were for her words. While the book primarily focuses on the natural history of the little island through the seasons, depicting seals, gulls, and lobsters, there are several pages of dialogue between the island and a kitten who had arrived by boat. In this back-and-forth, the kitten tries to determine the nature of the island and discovers that it is connected to everything else by land beneath the water’s surface. with the secret of it. This soothing picture book is a great read for children ages 4 and up. Sounds like a great book. I love Goodnight, Moon, too.